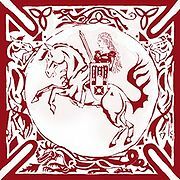 Sir Anastasia of Chamonix (aka) Shield Maiden graduated from Grinnell College in 2005. 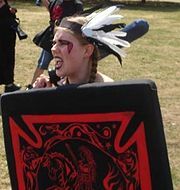 A die-hard sword-board fanatic, she is happiest when rolling over gimps and successfully dodging arrows. She is always busy running her new realm Andúril at the University of California Irvine. Recently, she was married in the first Belegarth wedding event. Below, she is seen with the groom, Brian Marion, aka Golem, also a member originally from Chamonix. 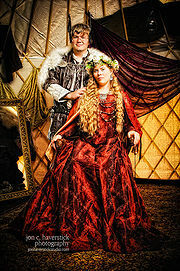 Anastasia and her husband at Wedageddon. This page was last modified on 8 June 2016, at 14:26.